The summer finally is there: wild flowers wear their last scented petals, the acacia trees cry white blossoms and the hillsides are starting to change into their dried, yellow, summer colour. The sea again is bright blue, as is the sky above. When also the white caps on the sea lie down, you can see straight through the clear water to the mysterious underwater landscape where fishes swim and seaweed merrily waves. But when the sea is so alluring, we now say: it is refugee weather. 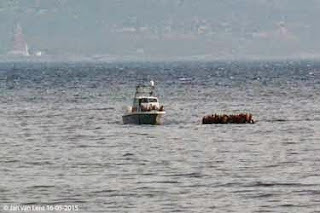 And yes, the next morning they again arrive in rubber boats containing sometimes as many as 50 or more people. When reaching the beach they may yell out with joy because they have made it safe and sound, when they fall into the water a bit out at sea they may scream, but most of them come ashore safely. This summer the sea will have to be shared with these people who have left home and country. And also bread and water has to be shared. Here in Molyvos there is no Red Cross or any other official institution. Just a couple of port police and some volunteers who, as soon as the boats are in sight (which is every day that there is no hard wind) receive hundreds of refugees with water, bread, diapers and, when needed, dry clothes. When the numbers are too big, or the need too great, they even might ask for assistance from the entire village, as happened a few weeks ago, when the parking lot next to the school was filled with cold wet refugees, and most villagers showed up to help out, which was an impressive sight. Never have the beaches of the island been so full with rubber boats, innertubes and lifejackets. A bit weird, because, also this year, some beaches got the Blue Flag designation: Tsamakia, Eftalou/Agi Anargri, Kaga, Anaxos, Agios Isidoros, Molyvos, Vatera and Thermis. Not even a hundred years ago the situation was much worse: during the first week of October 1922, 50.000 refugees arrived on Lesvos, mainly coming from Ayvalik and Izmir, where the Greek – Turkish war came to an end (the infamous population – exchange decided by the Treaty of Lausanne took place a year later). There was an American nurse in Izmir during the Great Catastrophe and later on in Lesvos, who gives a description of how disastrous this was on the island: Certain Samaritans (see chapter XIX). Lots of those people remained on the island, resulting in many inhabitants now are a descendant from a refugee. I do not think that there will be 50.000 refugees arriving on the island in one week, but some people estimate that there might be 1000 a day over the entire island, which already is quite a number. And we have not mentioned how many are making a safe landing on other Greek islands like Chios, Samos, Leros, Kos and Rhodes, other favourite places of the smugglers. The islands cannot deal with these high numbers and the government, well, they have their own crisis with Europe to deal with. So it will be pointless to ask for help. Two days ago, a group of 120 refugees arrived in Eftalou, and the occupants of one boat had to be saved out at sea. A lot of shouting was heard: from the port police in order to keep the people calm in the drifting dinghy, and from the others out of fear of drowning. They were all picked up safely and received in the harbour of Molyvos (the parking lot next to the school is only used when the school is closed), where volunteers saw that they got bread, water and when needed, dry clothes. Amongst them was a man in a wheelchair and even a man who recently had heart surgery, was diabetic and who had lost his much needed medicines in the sea. Because Mytilini also had too many arrivals they would not send a bus to pick them up. So a meadow nearby was quickly mowed, where the group could have a bivouac and they could easily have passed the night there. Mandamados also filled up with refugees the same day. I doubt that the monastery there gave them shelter and help. From Mandamados, refugees normally walk to the capital. Today a little group made a perfect landing on the pebbles of one of the beaches in Eftalou. Children, parents and grandparents, they all were fine and happy and immediately started to phone to whomever it was, telling they had made it into Europe. People living nearby started cleaning up around them, inner tubes, lifejackets and other garbage and passersby stood still for a minute to watch and then continued walking or driving, as this has become a daily scene. And it indeed has become an event happening each day. When the arrivals are not in need – like this particular group – they have to make their own way to Molyvos. In Greece it is forbidden to help them with transport or other things; you risk arrest because that is considered as helping the smugglers. Today is another hot summer day with a sea that is perfect to cross. In Izmir some ten thousand refugees wait to make the journey to Europe, so for sure tomorrow there will be a new group arriving. But meanwhile also the number of tourists has increased and all restaurants and shops are open in the harbour. A large group of refugees hanging out does not form the best scenery to have at lunch or dinner. So part of the business people complain that they cannot earn money (other owners help the refugees in day time and in the night they run their restaurant). But it's money that they all need here in Greece, because they have to pay lots of taxes and many a business is not too far from bankruptcy. Not all tourists are happy to be confronted with a reality they only know from the news. And their governments pretend it is only the problem of Greece, Italy and Spain. One leader even dared to say that those countries were just unlucky to be at the borders of Europe. Unity in Europe? No way! Also travel companies are not happy with so many refugees. One of them ordered a local agent to be informed of everything happening on the island. Why? Are their clients to weak to meet this problem from eye to eye? A big cruise organization threatened not visiting the island anymore if a quay, serving as a rounding up place for refugees (the shelter is already for a long time overcrowded), will not be cleared soon. Imagine that their precious guests will be confronted with the misery of others! The Greek islands have not been hit by a disastrous earthquake, as has Nepal. Life goes on and the refugees are not always visible. As a tourist you might bump into them or you might not. So you can enjoy your holiday, even though this may sound a bit odd. The Greek islands are just a transit port for refugees. It is in Athens where hell starts again, where they arrive in the streets or create make-shift camps, and from where they plan what next step to take. It is only a few that desire to stay in Greece. And because they cannot just take a plane or book a ferry trip, they depend again on the smugglers. And of those there are nowadays many and they are everywhere. If the refugees continue to arrive in increasing numbers (which is expected), there will be big problems. Private people cannot provide each day the bread, the clothes and the diapers needed. The municipalities or the government really should provide new shelters and send experienced helpers, otherwise the tide will turn and the Greeks will become irritated. I wish that the old Syrian city of Palmyra also could flee and arrive safe on the beaches of Eftalou. I really hope that this international heritage site can stay out of the hands of the new barbarians, who are the reason the refugee number has now reached biblical proportions. It is time that the world takes more action against those godless fools who are poisoning the world. This is good and fair description... the depressing thing is that this will not stop even if some of the white tops on the waves return. The volunteers are showing signs of exhaustion . Hi Sebastien - you can find out everything about how to help, what to bring etc from this Facebook page set up by local volunteers: https://www.facebook.com/HelpForRefugeesInMolyvos?fref=ts. Have a wonderful time on Lesvos - such a beautiful and special place.